The name of several places apparently in ancient Palestine. The second element is the name of the Philistine god Dagon. In the Old Testament mention is made of a city called "Beth-dagon," allotted to the tribe of Judah (Josh. xv. 41; compare Tosef., Oh. iii. 9); and within the territory of the tribe of Asher there was also a Beth-dagon (Josh. xix. 27; compare Tosef., Sheb. vii. 13). Sennacherib also mentions a Bit-daganna on his inscriptions (see Schrader, "K. B." ii. 92; Delitzsch, "Wo Lag das Paradies?" p. 289) which appears to be a third distinct locality. Beth-dagon occurs at the present day as the name of various places in Palestine; but it is doubtful whether any ancient cities can be associated with them. The Beth-dagon southeast of Jaffa is probably too far north for the Judean city mentioned in Josh. xv. 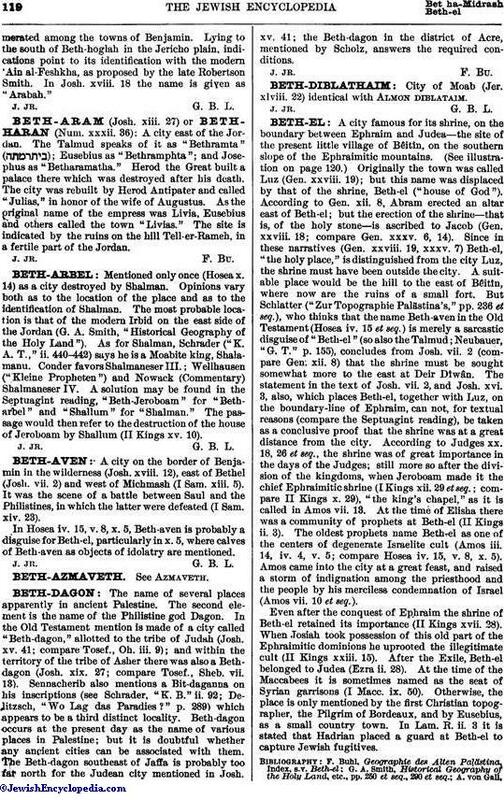 41; the Beth-dagon in the district of Acre, mentioned by Scholz, answers the required conditions.